Premier Art Management's next musical surprise for Baku residents willnotbelongincoming. Russian piano virtuoso Denis Matsuev will soon delight his music fans. 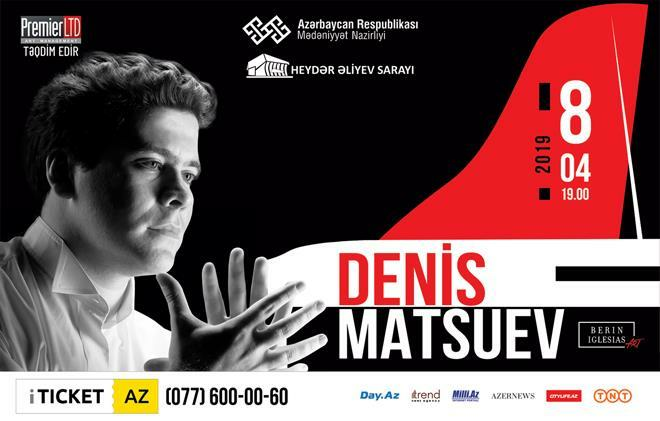 Denis Matsuev will give a solo concert at the Heydar Aliyev Palace on April 8, Trend Life reported. Tickets are sold at the box office of the city, ASAN Service Centers and website iticket.az. Tickets cost 20-220 AZN ($ 12-129). Trend Life presents an interview with a musician,in which he shares his thoughts about music, dreams and the upcoming concert. Q:What did you want to be as a kid? A:Truck driver with international rights to view the world. But then I realized that it was not easy and decided to become a pianist. Q:Do you feel nervous about concerts? A: It's rather not excitement, but internal boiling and the desire to go on stage as quickly as possible. Whenever I see a crowded room with a corner of my eye, I instantly calm down. Q: In one of the interviews you said that you treat the piano as a living being. A: For me, piano is a living being, with its own character. Even if there are several concerts on the same instrument in the same hall, it can behave completely unpredictably every time. The final result depends on how you treat the tool.This is a whole science, how to make it sound. And in one answer to the question it is impossible to reveal all the secrets. Q: What award is especially valuable for you? A: The love of my daughter Anna Denisovna. Q: Where is the most appreciative audience, in your opinion? A: In my opinion, warmly welcome of the audience depends on the person who takes the stage. Q:In what concert halls do you like to perform? A:I have 260 concerts a year in 60 countries of the world. I can't single out one of the halls, because the relationship with the audience is very similar to the relationship with the instrument; here, too, everything must coincide in a good way for the magic to emerge, for which I go to the stage almost every evening. Stunning concert can take place even in the smallest hall of a tiny town. And, on the contrary, in the most famous hall with perfect acoustics, there can be a feeling of emptiness and an unfulfilled idea. Q:What does music mean for you? A:It is a unique opportunity to be on stage almost every day. This allows the performer to pass through himself, his gut, soul, mind, the music written many years ago by the composer, and thus convey to the spectator, who came to the concert, the author's intention, and his own comprehension. This is both happiness and great responsibility at the same time. Q:What is the main quality necessary for a concert pianist? A:To get insight the essence of the work and try to fulfill as accurately as possible what the composer wrote. Q: You are an official of the concern Yamaha. What does this mean to you? A: With Yamaha, we have a friendship for over 25 years. Nevertheless, I have a warm relationship with Steinway and other tool makers. Our overall success with Yamaha was my victory at the Tchaikovsky Competition (I played the entire competition program on this particular piano). This was the second significant event for the company after Richter played the piano of this company for 15 years. I share their philosophy of life, the desire to do what they truly believe. It helps them create great tools. At the next Tchaikovsky Competition, there will be an awesome Yamaha model that I recently tried. Q:According to the Forbes magazine, you are included in the list of the 50 most famous people of Russia. A:I am also included into the list ofthe millionaires! Of course, I would be proud of myself if I had that kind of money, but now the pianist cannot earn millions. A: One of the most unloved topics for me is to discuss money and fees, my own and especially strangers. In my environment there are no people who would set themselves a goal in life to make millions. Of course, everyone should receive a decent payment for their work, but in the case of a classical musician's career there is no guarantee that he will be adequately provided financially. As far as my attitude to money is concerned, I am absolutely convinced that if thanks to money you have the opportunity to help your neighbor, the weak, especially young musicians, you should definitely take the opportunity to take advantage. And do it not to the public. Q: Classical music is considered the lot of the elite public, absolutely far from the needs of the youth audience? A: Now the situation, fortunately changing. The number of young people who start going to concerts of classical music is growing. And we can talk about it confidently. But to fight with show business is really unreal, here victory is impossible. If there is a choice, or at least a wider access to the classics for young people at the expense of television, radio, and new technologies, this will already help change the situation for the better. Q: After one of the concerts in Paris, the grandson of Rachmaninov approached you and said: "If you stop smoking, I will give you a great gift." You quit smoking, and what was the gift? A: Of course. These were previously not published scores of works that Rachmaninov wrote in 1891, Fugue in D minor. Q: And now about the Baku concert, which will be held at the Heydar Aliyev Palace on April 8. What is the concert program and what determines the choice of works? A: I really love this music: Beethoven's Sonata No. 17, Variations on Corelli's theme by Rachmaninov, Chopin's Ballade No. 4, Prokofiev's Sonata No. 7. With each of these works, I have a separate history of relationships, a period of my life, memories. I have been playing some works for more than 25 years, some for about 10 years. But playing this music for me is like a premiere every time I go on stage. I look forward to meeting with the Baku public, whom I love very much for its warmth, friendliness, and openness. I have repeatedly visited Baku with concerts and was able to fully feel the hospitality ofBakuvians. Q: First piece you played? A: Melody from "Weather Forecast". Q: What does "Spartak" football club mean for you? A: Huge part of my life. Q: What does the Russian bath mean for you? A: It is a dope. A: Love is a magic. Q: What does the creativity means for you? A: Do not hurt but help. Q: What is your cherished dream?